From the northern land of Barbaria where white men dwell, hails the hero known by many as Tuskar. 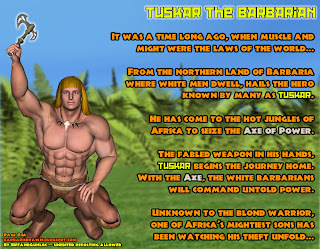 He has come to the hot jungles of Africa to seize the Axe of Power. The fabled weapon in his hands, Tuskar begins the journey home. With the Axe, the white barbarians will command untold power.